Mix together the garlic, lemon grass, basil, turmeric, yogurt and some seasoning. Spoon over to coat the cod and leave to marinate for 15 minutes. 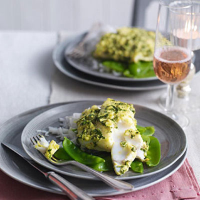 Arrange the cod fillets on a baking sheet. Preheat the grill. Grill the fish for 3–4 minutes on each side, turning once until the flesh is firm and opaque. Lightly steam the mange tout. Place the cod on top of the mange tout and serve with rice. You can replace the cod with any firm white fish such as haddock or pollack. The aromatic flavours of basil and lemongrass favour a crisp rosé that’s both elegant and full of flavour. Try Foncaussade Les Parcelles Rosé 2009 Bergerac, South of France.